What is weight training tempo? On this page, I’ll explain all you need to know about understanding and using training tempo for lifting weights. Specifically, I’ll discuss the importance of tempo, how to write it and the common tempos commonly prescribed for different training objectives. 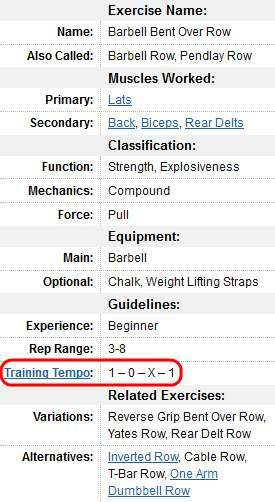 What Is Weight Training Tempo? Weight training tempo refers to the rhythm of a repetition for a given exercise. ** For some cable exercises, it makes more sense to think of the “top” of the rep as the point where the target muscles are fully contracted; and the “bottom” of the rep as when the target muscles are fully stretched. Let’s use triceps pushdown as an example: The “bottom” of the rep is when the bar is higher and your elbows are fully bent, and the “top” of the rep is the bar is lower and your elbows are fully extended. It’s important to note that tempo is different than velocity (i.e. bar or body speed). However, tempo and velocity are correlated (i.e. faster tempo = higher velocity, slower tempo = lower velocity). In many cases, either method can be used to achieve the same training objective (e.g. speed/explosiveness training, max strength, hypertrophy, power). However, all else being equal, velocity based training will produce better results over time — assuming you have a velocity tracking device like the Beast Sensor that can accurately measure and record bar/body speed. The chart below shows what this tempo means. 1, 2, 3 and 4 are in the order that the rep is performed. This is the case for all exercises starting with the eccentric, which makes it easy to understand. 1, 2, 3 and 4 are not in the order that a rep is actually performed. This can be slightly confusing, but it is correct; and it is the case for all exercises starting with the concentric. Some exercises are best performed explosively. That means that the concentric rep is done as fast as possible (without sacrificing good form). The notation used to signify an explosive concentric is an ‘X’ as is shown in the example below. There are tons of different training tempos out there. But I’m not going go over them all. …If you’re new to lifting, you should pay more attention to tempo – actually counting in your head if it helps – so that you’re able to lower the weight slowly and lift it using the right muscles. And if you’re more advanced, but have a specific goal in mind, then focusing on training tempo may also be important. The type of tempo, of course, depends on the specific goal. But like I mentioned earlier, the purpose of this post is not to present an exhaustive list of training tempos. Generally, though, you don’t have to be super strict about training tempo. In all of the weight lifting exercise guides on Kingofthegym.com, I put a recommended tempo in the exercise information chart (as shown in the image on the right). Please realize that these are just general guidelines. You don’t have to use the recommended tempo if it feels wrong to you or if it’s not conducive to your goals.